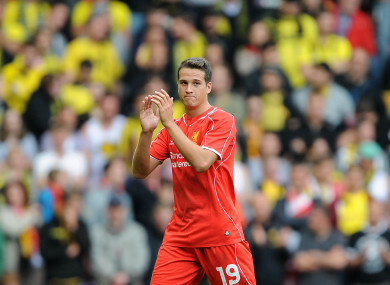 Javier Manquillo was on loan at Sunderland last season. Manquillo is coming back to England. NEWCASTLE UNITED HAVE made their second signing this week after completing the capture of Spanish defender Javier Manquillo. Manquillo put pen to paper on a three-year deal at the newly-promoted Premier League club, who snapped up the right-back for an undisclosed fee. The 23-year-old makes an immediate return to the Premier League having spent last season on loan at the Magpies’ fierce rivals Sunderland, while Liverpool first brought Manquillo to English football in 2014 on a two-year loan deal, which was cut short after only 19 appearances. “I’m very happy to be here. From the first moment that Rafa Benitez called me, I just knew that I had to come here, to such a big club,” said Manquillo. Manquillo, who made 22 appearances for Sunderland last season as the Black Cats were relegated to the Championship, hasn’t enjoyed the best of times in the English top flight, but Magpies boss Rafael Benitez wants him to seize his chance. “He can play both sides of the defence and he has a lot of motivation because he knows he has a point to prove,” said Benitez. Manquillo is Newcastle’s fourth summer signing following the arrivals of Christian Atsu, Florian Lejeune and Jacob Murphy, who joined for €13.6 million from Norwich City on Wednesday. Email “Newcastle complete signing of former Liverpool defender from Atletico ”. Feedback on “Newcastle complete signing of former Liverpool defender from Atletico ”.